We attended the Mortgage Bankers Convention in early February 2019 and this is our outlook from that event (you can watch the entire video feed interview Christian Marabella did at the Mortgage Bankers Convention in early February 2019 on the Marabella Website Home Page at http://www.marabellafinance.com). 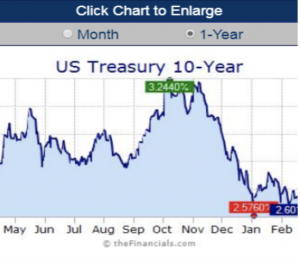 The U.S. 10 year treasury yield is currently at 2.60% +/- (as of 3/18/19) down from 3.21% (as of 11/5/18). This is anapproximate decrease of 61 bases points. This is due to the trade war, political division, U.S. Government shut down, U.S., China and Europe slowdown and other factors. Although the decrease in the price of oil and gasoline in the same time period has given consumers / businesses and investors some relief. This is yielding Net Lease owners and buyers a window of opportunity to lock in very low rates and attractive financing terms for Single and Multi Tenant Net Lease properties. Rates may possibly increase in the 2nd, 3rd and 4th quarter of 2019 as we are coming into an election year shortly. At the Mortgage Bankers convention we surveyed our universe of Net lenders that we have a track record of financing Net Lease properties and they are not pulling back and would like to lend on quality Net Lease single and multi tenant properties. They are still seeking acquisition, refinance, cash-out and take-out financing for Walgreens, CVS, 7-Eleven, Dollar General, Jack In The Box and other single and multi tenant Net Lease Properties. Average pricing we are seeing at this time is 4.50% to 5.375% depending on the use of the property we are financing, length of primary lease term remaining, credit quality of the sponsor and tenant and loan terms and structure requested for the transaction. 1031 Acquisition Loan, I am involved in a 1031 exchange and need to replace debt on a net lease property. Cash-Out Loan, Own my Net Lease Property Free and Clear of debt and would like to pull cash- out to pay off an existing partner, pay for tenant improvements and leasing commissions for this property or other property, need money to fund a child or grandchild’s college education or need additional funds for any other reason. Refinance, Would like to refinance an existing loan on a single or multi tenant net lease. Take-Out of Construction Loan, Seeking to take out a construction loan on a single or multi tenant net lease property to lock in longer term financing.